Dorothy Day (1897-1980) was a prominent Catholic, writer, social activist, and cofounder of a movement dedicated to serving the poorest of the poor. Her life has been revealed through her own writings as well as the work of historians, theologians, and academics. What has been missing until now is a more personal account from the point of view of someone who knew her well. 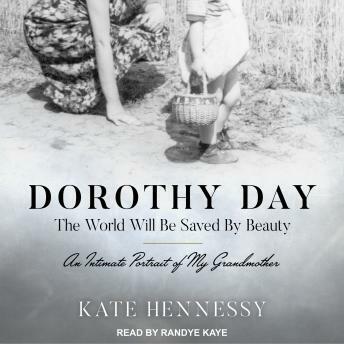 Dorothy Day: The World Will Be Saved by Beauty is a frank and reflective, heartfelt and humorous portrayal as written by her granddaughter, Kate Hennessy. Dorothy Day challenges ideas of plaster saints and of saintly women. Day is an unusual candidate for sainthood. Before her conversion, she lived what she called a 'disorderly life,' during which she had an abortion and then gave birth to a child out of wedlock. After her conversion, she was both an obedient servant and a rigorous challenger of the Church. She was a prolific writer whose books are still widely read. While tenderly rendered, this account will show her as driven to do good but dogmatic, loving but judgmental, in particular with regards to her only daughter, Tamar. She was also full of humor and laughter, and could light up any room she entered.